the winner of the Render of the Week Award for the week of May 14, 2012. After " Bidirectional Interior" where I did compare the 3 renderers for an indoor scene, I decided to do the same for an outdoor arch viz. Yafaray (Photon Mapping): 18 min. Cycles with GTX460: 9 min. The goal is not to get the same renderings, but to observe what happen when you switch between the three methods, with as lest changes of settings as possible (only shaders & lights). The three renderings have almost the same post-compositing based on the BI passes (Blender nodes, color correction, vignetting, fog effect,...). The scene is not really complex (a simple snow ground, basic architecture, few furnitures, ...), the shaders are not sophisticated. The forest is made with a particle system and only one birch tree made with a slaping add-on. The sky lighting is obtained with an UVmapped hemisphere, used as an emit object for shader. This simple method provides good and fast results for all kinds of render engine, saving lot of time. Of course, BI doesn't have a Global Illumination solution, but GI is not really necessary for outdoor scene, specially in this case, and the Ambient Occlusion can be very usefull to simulate this kind of lighting with an HDR environnement. I believe, every new Blender user must learn to know how to use the Blender Internal. The method is quite old, but you get to learn a lot about how to configure the textures and lightings. It's useful for improving your technical skills. Blender Internal is pretty fast and versatile with several of rendering passes. After BI, I've needed just a few minutes to configure the lighting method and the shaders in Yafaray. That's what I love with Yafaray, its workflow is very easy and fast, providing good results. New users can easily see that. Renderings are pretty fast that it's helpful for configuring the right settings and the border render allows fast previews on focalized areas. The rendering with Yafaray and it GI solution is 50% slower than BI on the same size (1600 x 1200 px), but it's pretty fast and requires less tweaks in lightings. Cycles still has much room to be improved but is very efficient for outdoor--unlike for indoor arch viz. This is because it uses only a Pathtracing integrator, more suitable with opened scene and huge light source. To produce the final rendering, I had to convert each shader to make it fit for Cycles. I like the versatility and the power of its node shaders, but it's imperative to have a good CUDA graphic card with you so as to benefit from the full potential of this render engine. That's why I used my Nvidia GTX 460 (1 GB RAM & 336 CUDA cores) to get a good rendering time. With CPU it would take more than one hour! With a simple outdoor scene as in this case (no transparent leaves on trees, no grass,etc...), Blender users will be able to use different methods and renderers. With BI, the basic solution, you can do the job but you needs more tweaks and extra time to enhance the result. Yafaray, as external GI and biased solution, is the fastest and easiest way to get a photorealistic result on CPU! After passing a little time to know Yafaray, it's a real pleasure. 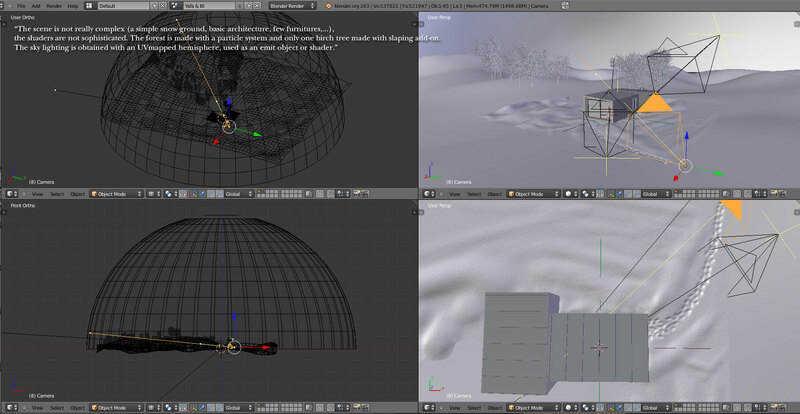 As for Cycles, it's very useful with the realtime preview, and its node system provides incredible results. But in most cases, You need a good--sometimes expansive--Nvidia graphic cards. intel i7-2600k ( 3,4GHz), 16 Go DDRam, Nvidia GTX 460 1GoRam ( 336 cuda cores), windows7 64bits. Yafaray & BI rendering processed with 4 cores CPU, Cycles render on GPU. Made with official Blender 2.63a-64bits & official Yafaray 0.1.2 beta5a-64bits.